Refresh your space with these bold shades! When we heard that Chip and Joanna Gaines would be introducing 44 chalk-style paint colors to their Magnolia Home paint line this spring, we immediately started putting together our inspiration boards. With the warmer weather coming, now is the perfect time to revamp your space with some DIY projects and fun pops of color. From kitchen upgrades to flipping vintage finds, we pulled some of our favorite ways to use these new paint colors. If you’re sick of generic windows and want to bring them to life, try painting the frames to give them more depth. Your eye is most likely drawn to the natural light in your room, so this subtle introduction of new color will only enhance this focal point. We love the shade of dark gray used on these oversized industrial windows. You’ll be able to score a moody frame, just like this one, with the likes of “Duke Grey” from Magnolia Home. The best part? This project is quick but will leave a big impact. While not everyone is a fan of bright colors in their living spaces, a nursery or child’s bedroom is the perfect place to experiment with colorful shades. This bold pink dresser brings life to this room rather than having a neutral piece in its place. Use the color “Cabbage Rose” on a pre-existing item or a flea market find to give it a proper facelift. With the help of some paint, you’ll have yourself a whole new look in no time. If you want to experiment with shades you normally wouldn’t use in your home, like a country-style green, try an accent wall. With a couple coats of “Olive Green”, you’ll have a homey backdrop without overwhelming your space with too much color. Stairs often get a great makeover with the help of paint or an area rug, but more often than not, the walls are forgotten. We say it’s time to go bold! The contrast of the red and black creates a dramatic aesthetic in this room. A can of “Home at Last” will help you get this look. Using pipes to craft an awesome DIY project is more and more common these days – and for good reason. It’s a cheap and easy way to add industrial elements to your home. If you’re not a fan of the pipe in its natural state, you can put your own twist on the project. Use a bright “Heirloom Yellow” like in this picture, to turn your shelves into a modern display with a few quick coats. To add a feminine touch to any room, try a soft pink like the adorable “Ella Rose.” Chalk-style paint does wonders on chairs that have seen better days. Give them a second life either at the dining table or as accents in the living room. Bathrooms don’t always get the attention they deserve. They may not be your number one priority in terms of decorating and budget, but you can still add your own style with the help of a painting project. A dark and moody navy like “Silos District” will make your bathroom feel like a luxe resort. Who can say no to that? If you’re lost on how to add statement color in your home and aren’t sold on painting a full wall or your ceiling, try your doors. Sliding barn doors painted in a light shade of gray like “Times Past” will introduce a more rustic element to your home while simultaneously adding a bit of complexity to any given room. Don’t want to invest a lot of money into replacing your kitchen cabinets? You’re in luck! Painting your cabinets is easy and just requires a great quality paint, patience, and a good playlist. A mushroom neutral like “Garden Trowel” is a dark enough shade to notice a difference, but still light enough to make your kitchen feel spacious and airy. Add new hardware, and your kitchen will look good as new. How could we do a Magnolia Home roundup without including the classic “Shiplap”? 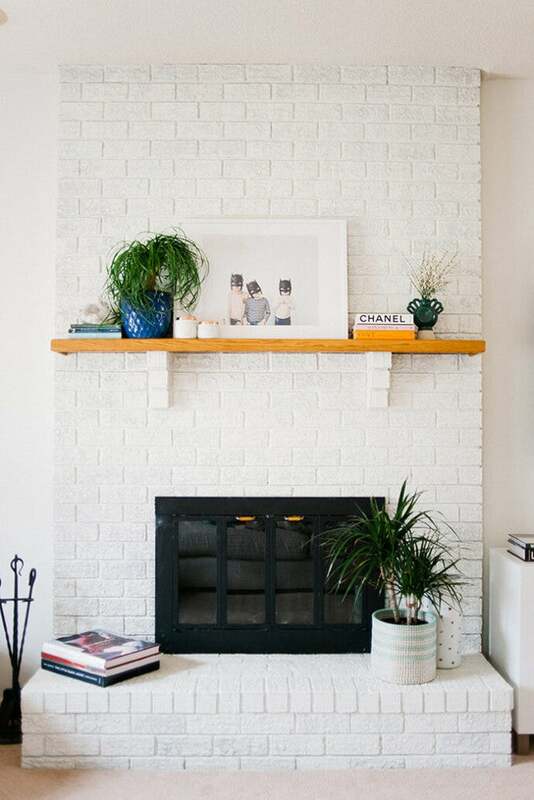 From picture frames to dressers, this paint color is on point on just about anything—even exposed brick.